Yesterday, I got to meet a mommy who has five little ones in Heaven. She has faced unthinkable loss and has every reason in the world to turn her back on the Lord and walk far away from Him. But the way I met her? She was delivering boxes to the hospital from the non-profit she started after losing her twins to stillbirth. These boxes are given to mommies and daddies who are forced to leave the hospital without their child. They were created specifically for stillbirth situations, but at our hospital we use them after the death of not just infants but children of many ages. She has chosen to use her pain and loss to not only bring glory to our Lord, but to comfort those in situations of the same kind of loss that she has faced. She perfectly embodies the verse in Corinthians about using the comfort we have received from Christ to comfort those around us. No one can fully understand what it is like to leave your baby or child at the hospital while you go home to face life once again. It is a horribly guilty, empty, bewildering feeling. Your heart knows where your baby really is, walking perfectly with Jesus in Heaven, but your womb. Your womb is screaming for that baby. Your arms are literally heavy with the emptiness. You fight with feelings of guilt over walking away from the building that holds your child. Your mind wanders to where they are, exactly. Who is with them? Are they alone? Are they being treated with respect and reverence? Are they lonely? Your thoughts aren't necessarily logical, but what about losing a child is? What is logical about handing your child back to the nurse after you have carried her in your womb and grown her from nothing and labored through the pain and turmoil just to see her face? What is logical about that final hand-off, knowing your hands and eyes will never touch her again this side of Heaven? What is logical about that? I remember being absolutely stone cold terrified of the moment we'd have to hand Lily back to the nurse forever. With each hour of labor I knew that moment was getting closer and closer. Some people have asked me why I chose to go through with a full blown 24 hour labor with Lily when I knew what the outcome would be? Couldn't I have chosen to be put to sleep? The answer is yes, but that thought never once crossed my mind as a possibility. When the doctor told me my options at my last ultrasound with Lily, I cut him off in the middle and told him absolutely not. I would not let them "take her" in a clinic somewhere and dispose of her somehow. I wanted to see her for myself, as hard as that might be. I had my reasons, and every mother's choice in that matter is so personal, but I think one of the big ones was that I wanted to put off that final moment as long as I possibly could. I struggled between wanting Lily out as fast as possible and being absolutely terrified of the moment she was out, because that meant the clock would start. My time with her would be incredibly short. While mothers are supposed to have a lifetime to gaze upon their child's face, I knew I had minutes, maybe hours after Lily was no longer attached to me. Now I serve a unique God. My God has walked that kind of despair. He has also had to face watching His beloved child leave the safe arms of His care. He has known loss. He has known grief. He has not only lost His one and only Son to a horrible death, but He has watched countless children leave His arms forever. He gets it. And when Lily was finally ready to make her appearance, I literally felt Him in the room with us, His peace surrounding us in a situation that is everything but peaceful. 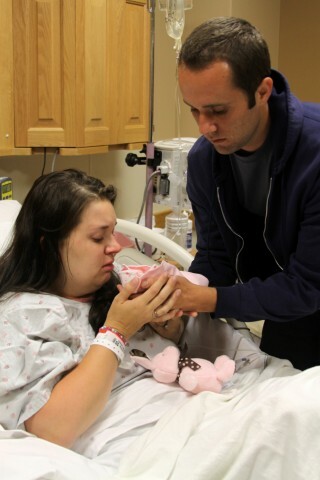 There were very hard moments during that long labor with Lily. There was one particular moment that is probably burned into my poor parents' brains forever because they unfortunately were in the room with us when God lifted that veil of comfort and allowed me to fully see what I was being asked to do, the moment I finally lost it. Halfway through my labor with Lily, this unthinkable situation hit me like a ton of bricks, and God lifted that peace momentarily so I could fully understand the hugeness of what He was asking of me. I sobbed in that hospital bed uncontrollably, screaming incoherent thoughts about how I could not possibly give birth to a dead baby. Begging God to please, please not make me do this. I couldn't do this. I didn't want to. There has to be another way. Looking back, it reminds me of those moments in the Garden of Gethsemane when Jesus was also hit with the overwhelming pain of what He was being asked to do. Jesus says in Matthew 26, "My soul is overwhelmed with sorrow to the point of death..." I have no better explanation of what it feels like to give birth to a dead baby than that verse right there. Jesus said it as He was facing crucifixion, and He felt it, and somehow that comforts me, that my God has been to that place too. That He too has begged for another way out. He says later in the chapter, "My Father, if it is possible, may this cup be taken from me.Yet, not as I will, but as you will." That's where I was. Begging God to take this cup from me. Begging for another way. Overwhelmed with sorrow to the point of death. And there, right there, God met me. He allowed me to experience the enormity of the situation because I think it was important for me to understand how huge He must be to get me through it. He let me feel it, express it, and then He dropped that blanket of peace right back over me again. He gave me the strength and will to continue, and I did, but only because my God met me there and carried me through it. And being that the only reason I have eternity in Heaven to look forward to is because Jesus did not pass that cup, that God did not take it from Him, I am so incredibly grateful that He faced what He was being asked to do and allowed God to comfort Him through an unspeakable sorrow. Where would we be if He hadn't? Lily's birth was quiet and beautiful. Josh and I smiled through our tears when she was born. We anxiously peeked over the nurses shoulders trying to get a glimpse of her. We marveled over the simple smallness of her. We cried, and we prayed, and we talked about her seemingly muscular calves and lips that were exact replicas of her brother's. I sang her E*'s lullaby and an old George Straight song because it was simply the only thing I could think of. "Goodnight, Sweetheart, sleep tight, wherever you are. God holds you in His arms, while we're apart. Tucked away here in my heart. Goodnight, Sweetheart, sleep tight, wherever you are." 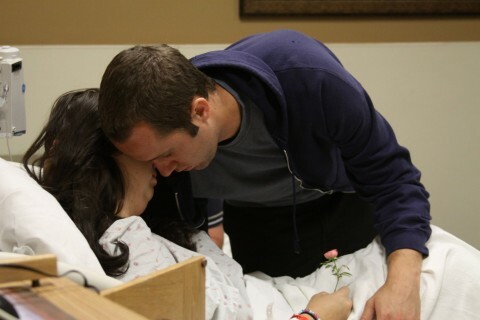 After our families met her and we had enough pictures (though sending that camera away was incredibly difficult as well, because the only lasting piece of my baby was so very limited, there would never, ever be enough pictures), we sent everyone out and had our last moments with her. 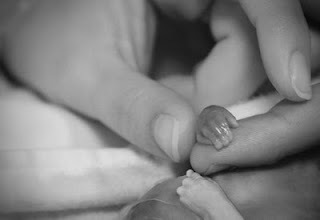 With a stillbirth, you are limited in your time. Not by the hospital staff, but by the tiny body of your child. You want so much to have good, beautiful memories of the way your baby looked. 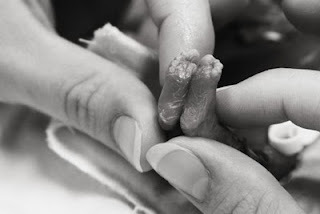 Unfortunately death is not kind to even the tiniest of bodies, and there comes a point when you need to close your eyes and not let the images of your child deteriorating enter your memories. Josh and I agreed it was time to say goodbye, and we did. It was not the moment I had pictured in my head, one of me sobbing uncontrollably while Josh practically had to rip my baby from my hands, but one of total peace. We kissed her sweet toes and told the nurse to please take her. We had spent two hours with her, and I will cherish those hours forever in my heart. And then. And then, Josh and I looked at each other, and asked, "Now what?" What is there after the birth of a baby when there is no baby? We were slightly thrown off. We didn't know what to do with ourselves. I remember sitting, confused, not knowing what to do next. There was nothing to do but go home. Empty handed, empty hearted. Our nurses were absolute angels. While I had been laboring with Lily, they had been preparing mementos for Josh and I to take home with us. They made keepsake footprint cards for each of our children, they made me and E* bracelets with Lily's name on them. They made a card with Lily's statistics and teeny tiny footprints on it. They gave me a box. A special box they give to mommies who have to go home empty handed, so that their hands aren't actually empty. So that they have something to hold on to when they are being wheeled away from the hospital, away from their child, while every fiber of their being screams for them to turn back and go get their baby. A box I imagine most mothers use to keep their own special keepsakes in along with the ones the hospital gives you. A box that was made by a woman who has faced leaving the hospital with only a box. A box that for me is now filled with cards and letters and pictures and a tiny pink bunny that I held throughout my entire labor. A box that is incredibly personal to me, something I can open up when I need proof that Lily was here. Because for mothers of stillborn babies, that's all we have. A box, a stuffed animal, a few pictures if we're lucky. That's all we have to prove to the world and ourselves that our child existed. I got to meet a woman who makes hundreds of these boxes to give to other mommies like me. Oh how we both wish these boxes weren't necessary! How we both wish we could have met under different circumstances, with a different common bond, in a different life where neither of us had gaping holes in our hearts that are only visible to those that bear them. But there we were, standing in the lobby of a hospital talking about these boxes. I was accepting her donation of boxes for our bereavement closet at the hospital where I work. I told her how much they meant to our parents of lost little ones, and how much they meant to me personally, as I too had a stillbirth and was the recipient of a box just like the ones she was handing me. God brings his children together in very unique ways sometimes! Sometimes it is over broken hearts. The two of us are not broken women. We have experienced brokenness, which means we have also experienced our Lord on a level not everyone does. We have both had loss inexplicable, but we have both known comfort unimaginable. In our own unique ways, we try to comfort those around us with that same comfort God has granted us. We try to make something of our nothingness. We work to make our babies proud of us, so that one day we can scoop them up and tell them the story of their birth, the story of their loss, the story of their impact. I am confident that Lily and my other sweet babies are part of such a bigger story. A story that I won't know the ending to for a very long time! But a story that tells of loss and comfort and love and patience and trust and a journey to our family complete. Thank you for taking time to peek into the hard and heartbreaking moments of mothers of lost babies. If you'd like to sponsor a box or a blanket for another mommy just like me, please visit owlloveyouforever.org.